Memorial Day is coming up this weekend. You have your grilling items I am sure...now you need a fun cocktail! 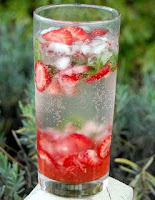 Slice the strawberries and place at the bottom of a tall glass along with the basil leaves. Pour in the simple syrup and muddle the mixture. Stir in the rum and top with crushed ice. Top off with club soda and garnish with strawberry slices. As a non alcoholic option serve up some lemonade with frozen blueberries now you have your red and blue!